Another of my favorite RPG games! This game has so many characters: there are 108 of them! The story was so deep. I recommended this game to all of my friends and they like it. You play as a young boy to save the world with all your 108 friends. There are several endings: Best ending (You must complete to collect all 108 characters), Normal ending, and worst ending. 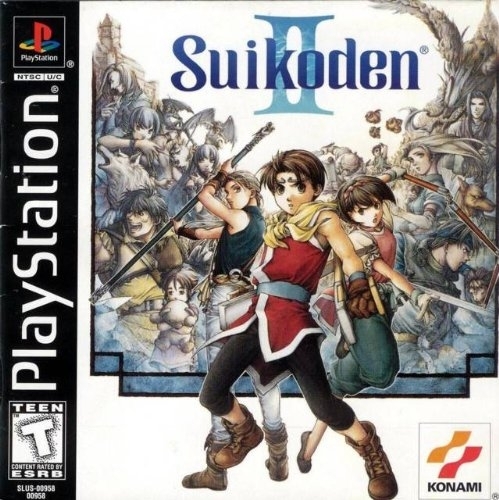 Suikoden II (pronounced SWEE-KO-DEN) is a console role-playing game developed and published by Konami for the PlayStation video game console and the second installment of the Suikoden video game series. It was released in 1999 in North America. 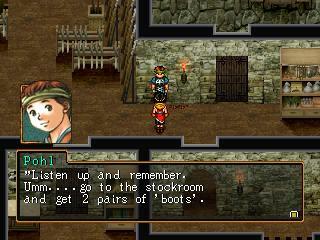 The game features a vast array of characters, with over 100 characters usable in combat and many more who move the plot forward. 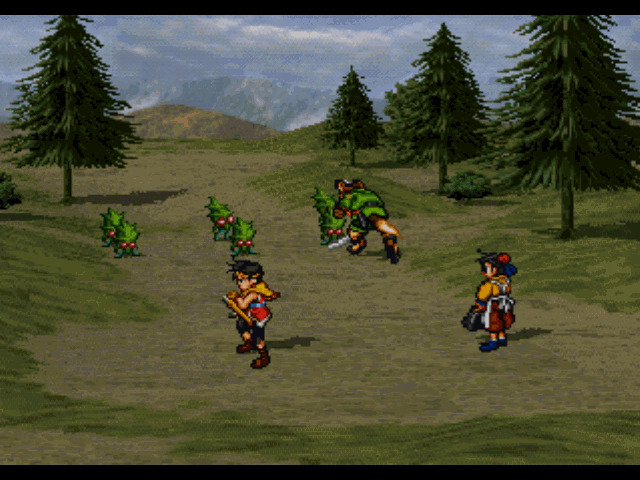 Suikoden II takes place years after the events of the original Suikoden, and centers around an invasion by the Kingdom of Highland of the City States of Jowston. 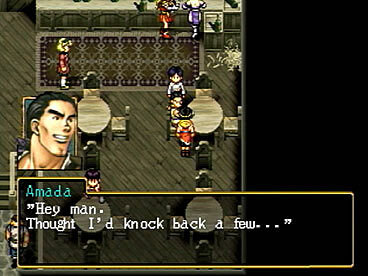 The player controls a quiet protagonist whose name is chosen by the player (named Riou in the Japanese novelization and Drama CD adaptation and Tao in the manga adaptation); he is the adopted son of Genkaku, a hero who saved the City-State of Jowston in a war against Highland years ago. 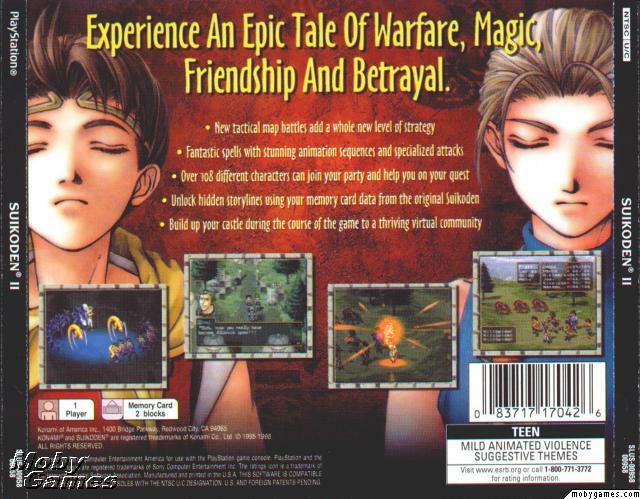 The protagonist and his best friend, Jowy Atreides, each gain one half of the Rune of the Beginning, one of the 27 True Runes of the Suikoden setting, and become caught up in the intrigues of the invasion and the dark fate of those who bear the halves of that Rune. You are a soldier in the Unicorn Brigade of the Highland Royal Army. 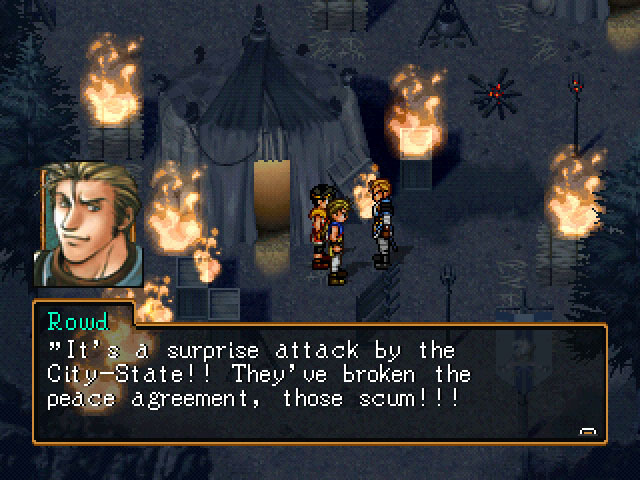 The main character and his best friend Jowy are about to return home to Kyaro Town when suddenly, a surprise attack happens and all of the unit is massacred by the "State Army" except for the Hero and Jowy. 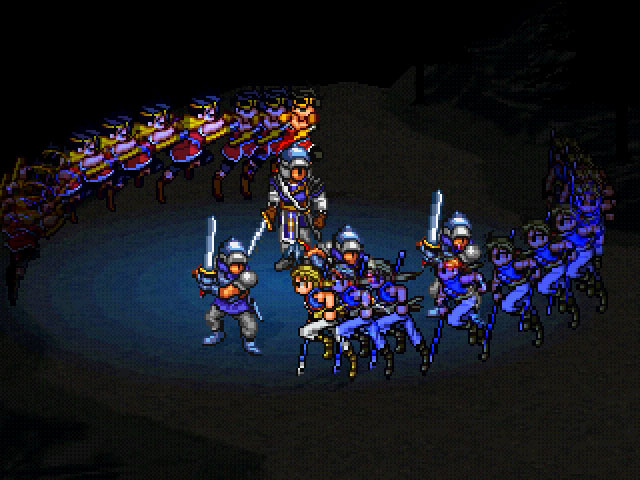 They turn back trying to avoid being killed and overhear Prince Luca Blight and their captain talking about the young soldiers in the unit dying for Luca's evil purposes. When the two young men are discovered by Rowd and Luca, they run away but are trapped at a cliff not too far away from the camp. 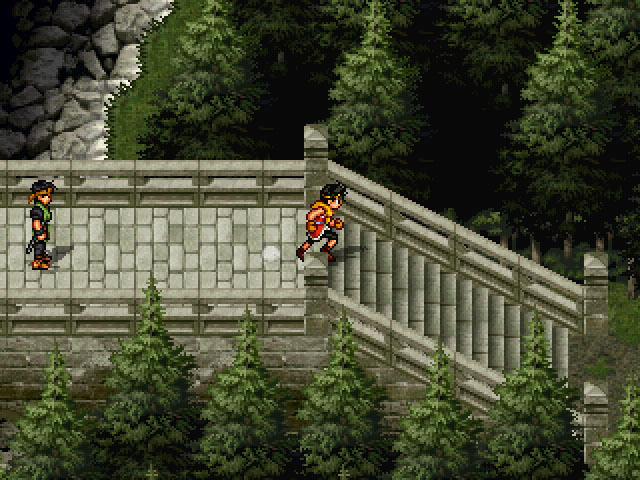 Promising to return to the cliff if they are ever separated, Hero and Jowy leap off the cliff into the river below. 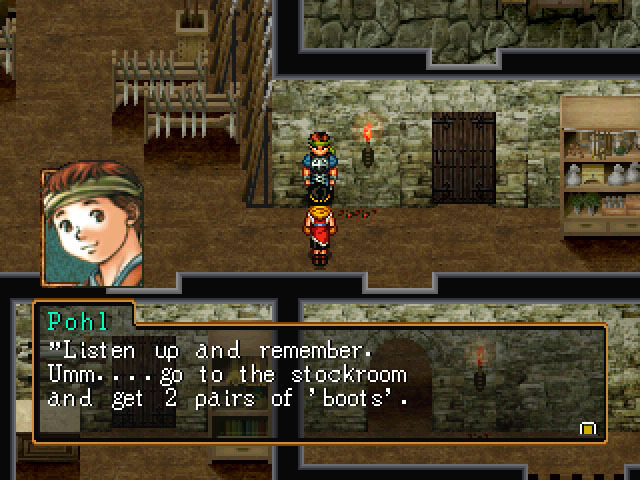 Suikoden II has it all! Great characters, memorable story, stunning 2D graphics, and a wondrous musical score. 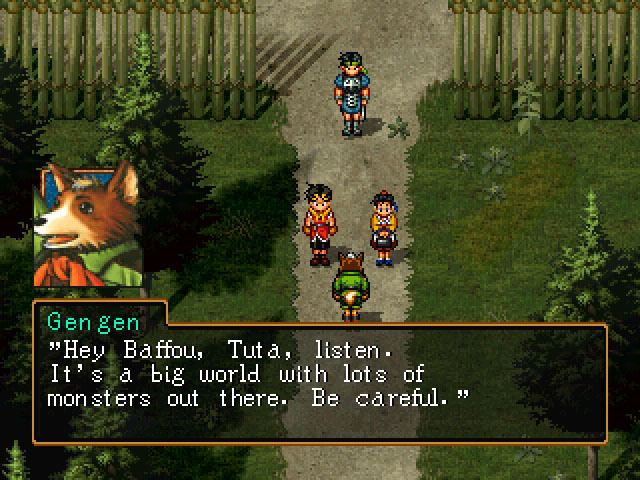 This is the best of the Suikoden series and as an old style Japanese RPG, it rivals even Final Fantasy 7 and 8 in quality, story depth, and visual beauty! 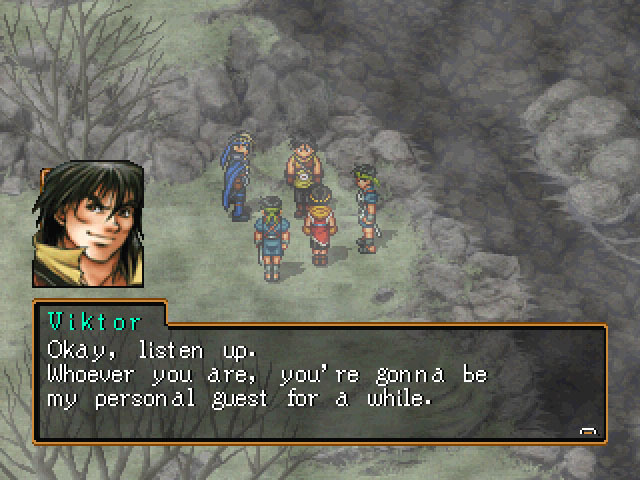 Suikoden II is the MOST overlooked RPG on the PSX and maybe of all role-playing games period. If you are one of the people that has never heard of or played this game. PLAY IT IMMEDIATELY!! This is one of my favorite game. The story is so good and from being a simple soldier. He bacame a Lord of his own castle by being a good leader. It's a story of best friends seperated by their destiny and in the end have to battle with each other. You will have to meet different people who will contribute to the growth of your castle. This is the best classic RPG game in PSX/PSOne, if graphic is not your the best concern. Story is great, sounds and music are awesome, game system is pretty rich, and the alternate endings are the best. This make you addicted to play the game over and over again. Another best thing is, they have a bug that let you level up quicker (matilda border). A bug that is loved. What a thing! Now you can add videos, screenshots, or other images (cover scans, disc scans, etc.) for Suikoden II [NTSC-U] to Emuparadise. Do it now!